Description: A very elegant and classy piece of clay jewelry by Alice! A Blue Topaz Paint on a Clay Stone. This is glued on a silver thread crocheted backing. I wanted some of the beads to be the same color of the stone so I also painted them the same color.. 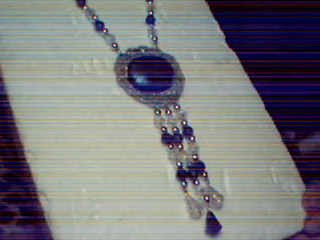 The rest of the beads are silver spacer beads..and chrysal beads..and at the bottom drop beads.